Mini dental implants are a great alternative to regular dental implants, if the area you are looking to fill is smaller or more narrow than regular sized dental implants will allow. If you have areas in your mouth that are too narrow for traditional dental implants, mini dental implants can be used. Not all Salt lake City dentists provide mini dental implants, but at The Sugar House Dentist we believe they are a great benefit to help provide implants for smaller or more narrow spaces. 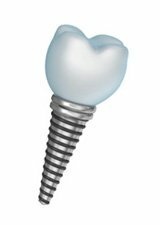 Similar to a traditional dental implant, a mini dental implants is an artificial titanium tooth root that is surgically anchored into your jaw bone. After the root is anchored and it fuses to your jawbone, the root can be used to anchor an artificial tooth. A mini dental implant provides you with a brand new, healthy artificial root and tooth. Once the artificial root is infused, which may take several months, the root can be used to hold a dental crown, a dental bridge or a denture. Mini dental implants are a great option for those with narrow or small missing teeth due to trauma, decay or age. To learn more about mini dental implants, schedule a visit with our doctors. Our professional and knowledgeable doctors will consult with you and discuss your options for receiving mini dental implants or traditional dental implants. We look forward to helping you to replace missing teeth and regain your beautiful smile! Visit us and smile today! Give us a call at our Salt Lake City dentist office if you are in the Sugar House – Millcreek UT area! For more information on implant dentistry available at The Sugar House Dentist, please visit our dental implants website!